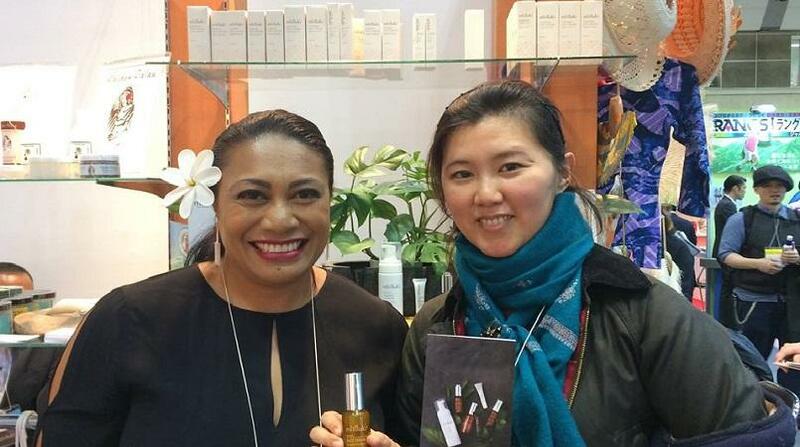 Samoa’s luxury skincare range Misiluki is making its debut in Japan at one of the largest gift shows in the world. Husband and wife team, Misiluki founder and CEO, Lufilufi Rasmussen and Director Michael Rasmussen are attending the 83rd Tokyo International Gift Show, which boasts 300,000 scheduled attendees and 2500 exhibitors at the three-day event. Lufilufi Rasmussen said the Japan trade show was part of an international marketing strategy aimed at securing agent representation and high-end chain store contracts. Rasmussen said Misiluki had had positive feedback from agents and distributors, commenting favourably on the packaging and the products themselves, and had scheduled follow-up meetings after the show. She said they were grateful for the support of the Pacific Islands Centre in Japan, and the Samoa Ambassador to Japan Fa’alavaau Perina Sila-Tualaulelei, who had been at the show each day and provided a Japanese translator for the show. PACNEWS reports Misiluki shared their sales booth with other high quality Pacific products such as designer clothing label TAV from the Cook Islands, as well as companies from the Republic of the Marshall Islands, the Federated States of Micronesia, Palau and Tonga.